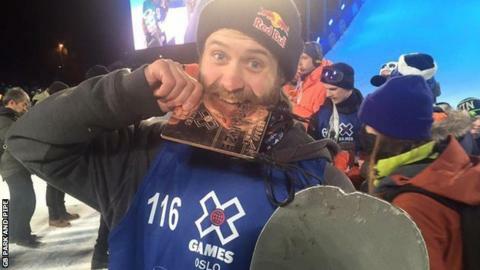 British snowboarder Billy Morgan has won a bronze medal in big air at the X Games in Oslo. He finished third with a score of 79.33. Japan's Yuki Kadono won with a phenomenal 90.66, just ahead of Canada's Max Parrot who scored 90.33. It is a first X Games medal for Morgan, who became the first person to land a 1800 degree jump in 2015. "I've always seen X Games as one of the biggest, raddest things out there," he said, after his 1440 triple cork. "So to be on the podium and compete with so many riders I look up to is amazing." Big air makes its Winter Games debut in PyeongChang in South Korea in 2018. Morgan, who finished 10th in slopestyle at the 2014 Winter Olympics in Sochi, only returned to the snow in December after having knee surgery in April. Britain, who won their first ever Winter Olympics medal on snow with Jenny Jones' slopestyle bronze two years ago, are aiming to add to the medal tally in big air in South Korea. There are a number of world class snowboarders and freestyle skiers in the medal zone, including Katie Ormerod, Aimee Fuller, Jamie Nicholls, Katie Summerhayes, Isabel Atkin and James Woods.